So you’re a newbie looking for a slice of the Internet pie…. Learn the tried-and-true methods that all the successful online earners use. I have yet to meet anyone who didn’t want an additional income stream – either as insurance against a loss of employment, or simply because hey, it’s more money. We’ve all heard the stories of people who make their own hours, who can work from anywhere in the world, and who don’t have to answer to a boss who abuses them. We hate those people, right? But unless those people are superior beings from a more advanced planet, there’s no reason you can’t be one of those people. There are lots of ways to build an income stream online, but the easiest and most intuitive ones revolve around the ideas in our No Cost Income Stream course. 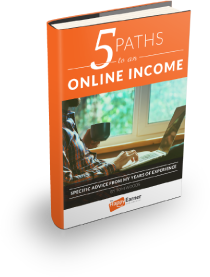 These 8 9 step-by-step screencast videos walk you through the five ways most online income earners make their livings. No need to reinvent the wheel. Building an email list works. Affiliate marketing (linking to other people’s products and earning a commission) works. Product creation works. Freelancing works. Video marketing works. You just need to learn how to do at least one of these things. And that’s what the No Cost Income Stream course teaches you, in step-by-step detail. The beauty of the Internet is that you can get started with little to no overhead. That’s obviously not true of starting a traditional small business. And in fact, this course includes the words No Cost because the tools it recommends are available on the Internet for free. What if instead of watching TV you spent a couple of hours a week, just to get started, working on this? That’s what lots of other people did to get their start. John Thornhill, one of the top Internet marketers today, worked on the production line of an automobile plant for ten years. He started fiddling around online on the side. And one day he marched in and quit that production line. Omar Martin was a New York City fire department paramedic. Doberman Dan, world-class copywriter, marketer, and entrepreneur, was a New York City policeman. They had no special insight, no “white privilege” nonsense, nothing you can’t have. They just learned, and worked at it. I’m not going to make ridiculous income claims and promises that insult your intelligence and mine. That’s stupid and nauseating. I’m not going to pretend that you’re just a few mouse clicks from making millions. That’s inane. What I will say is this: these are tried-and-true online income stream strategies. They’re not some new shiny object. If you’re serious, you’ll need to know them sooner or later. And one thing I can tell you for sure: people much less intelligent than you are earning very nice livings doing the things taught in this course. That’s a fact. Grab the No Cost Income Stream today and we’ll throw in a terrific bonus: the Internet Marketing Crash Course, a three-hour video seminar with one of the leading marketers in the industry. In those three hours he takes you behind the scenes and lets you look over his shoulder at how he implements the very strategies described in the No Cost Income Stream. Now’s the time where I’m supposed to give you some wildly inflated price for what this course might cost, and then tell you what a bargain you’re getting. Let’s skip that part, too, and say what should be obvious: this is extremely valuable information, really the indispensable foundation of anyone’s online monetization efforts. It could sell for a lot. The single biggest contributor to my own financial peace was my creation of multiple income streams online. So even if one of them should fall to $0, I’m still in great shape. That’s a comforting feeling, especially with five kids. No more panic-in-the-pit-of-your-stomach feeling. If you’re looking to dip your toe into these streams, there’s no better way to get started. Stream Today for Just $77!